Immersing students in the STREAM curriculum in an engaging manner is crucial in developing a passion for creativity and critical thinking. STREAM curriculum incorporates Science, Technology, Engineering, and Math, as well as Religion and the Arts, into students' learning. St. John's STREAM Academies are after-school, enrichment clubs designed to promote this curriculum. Register for Spring 2019 STREAM Academy courses by visiting http://bit.ly/STREAMSPRING19. Registration opens at 6:00 PM on Tuesday, March 12. 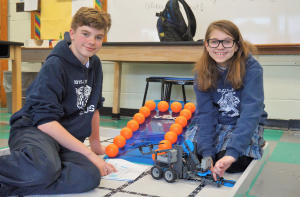 Robotics Club tasks students to build robotic devices capable of performing numerous functions, including moving blocks, pushing boxes, and clasping erasers. In order to successfully complete such fetes, these young engineers spent months devising plans to build robots that would meet the challenges. Available to middle school students, it is part of the school’s STEM/STREAM initiative that incorporates Science, Technology, Engineering, and Math, along with Religion and the Arts, into its curriculum. 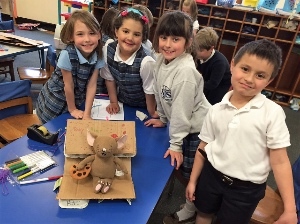 Students have the opportunity to work cooperatively, to trouble-shoot the strengths and weaknesses of their designs, and to master the mechanics of building. They needed to use their macro-skills from various disciplines of science and focus the concepts to a pin-pointed project. This requires students to go beyond rote memorization of facts and forces them to have a solid understanding of the concepts. 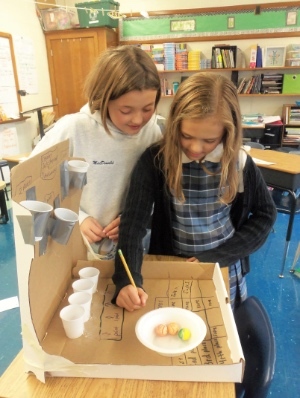 Based on "Caine's Arcade," this course invites students to design and build fun and engaging arcade games made from cardboard, recycled materials, and imagination. The games are then shared with the school community to help raise awareness and funds for a charity of the students' choice. The program incorporates “The 4 C's” (creativity, collaboration, communication, critical thinking) into this program and is entirely 100% dedicated to allowing students to develop these skills. In this beginner decorating class students will learn basic cake decorating techniques using the tools of a real baker. Students will learn how to frost a cake and a cupcake, create a border on the edge of a cake, create decorations and even write their own message. Students will explore and study the positive messages conveyed through art and music in our culture and zero in on having a powerful voice of Social Justice in their own artwork. Participants are challenged to identify a need or solve a problem using the same procedures an inventor would follow. This Academy culminates in a "Shark Tank"-like presentation where students will market and advertise their new invention. Students will learn about food preparation, origins of food, and healthy food choices. This favorite Academy combines math, science, and a love for cooking! LEGO bricks turn numbers, words, and ideas into real models that can be touched, described, and innovated! 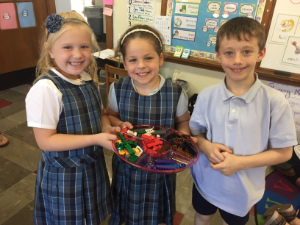 Each week, the students will undertake a design challenge connected to cross-curricular topics. . At the end of the program, all students will go home with a Lego creation of their own! Come to the rescue of your favorite fairytale characters. This Academy course adapts the engineering design process to meet the needs of our favorite fairytale characters! Students will problem solve, generate design proposals, collaborate, and make connections to the enchantment of engineering. Meet famous artists throughout history and their most notable pieces of art. Using various mediums and techniques, embrace your inner artist and recreate versions of some of these famous pieces of artwork. Generally grades 1 to 3. Working in groups, students of all abilities collaborate to solve challenging Math word problems. They experience new mathematical concepts and develop major strategies and flexible approaches for problem solving, while stimulating an enthusiasm and love for Mathematics. The program strengthens Mathematical intuition and fosters creativity and ingenuity. Ultimately, students experience satisfaction, joy, and the thrill of meeting challenges! Click here for additional information regarding our STREAM program.